Your ever-current online resource for answers to your tax questions about personal and corporate tax, and the GST. These instructional briefs provide an “educational” research library to assist in practice management – links to the Income Tax Act, publications and forms adjacent to teaching notes, issues and answers, examples, interview checklists and recent court cases. Personal, corporate and sales taxes are covered in 800 topics, using plain language. This library is best used in practice at “Monday Morning Meetings”, as a management tool to review mistakes made by tax practitioners or refresh on the theory behind new client profiles less familiar to the staff. It’s a great way to build up the knowledge of a tax team and increase average charges. The Knowledge Bureau invites you to take a test drive with a free demo. Find out instantly how to use this authoritative tax resource for personal and corporate tax compliance, and the GST. 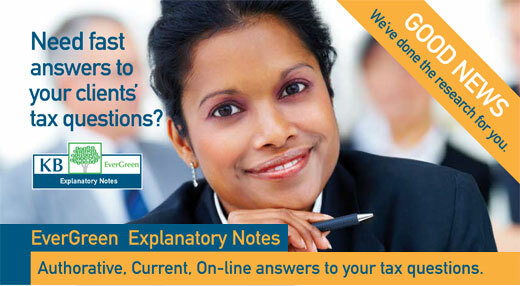 EverGreen can help you find the answers to your clients’ tax questions fast. The single user subscription is for a single user (the Subscriber) only. The Knowledge Bureau does not permit sharing of an account or access through a single user subscription being made available to multiple users within an organization or to other third parties. The Knowledge Bureau reserves the right to cancel the access of any Subscriber who allows use of his/her account by a third party. If access is required by more than one user, a branch office subscription is required. This single user license is for the professional that only requires this for 3 months at a time. Especially designed for busy tax seasons, for both personal and corporate use.